Food & Water Watch has called on the Securities Exchange Commission (SEC) to reject the stock registration filings of AquaBounty Technologies (ABTX), the maker of genetically engineered salmon, based on “misleading and erroneous claims the company is making in its attempt to join the NASDAQ stock exchange,” according to a letter sent to the SEC. The letter asks the SEC to make AquaBounty revise their document, since new scientific evidence allegedly shows GMO salmon do not grow as quickly as AquaBounty claims, and that the genetically engineered fish experience unique diseases. The Canadian study found that these GMO salmon are more susceptible to a “type of disease-causing bacteria than are domesticated salmon,” according to the letter. 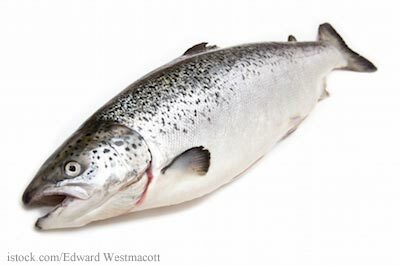 The fish is more susceptible to A. salmonicida than domesticated salmon and is highly susceptible to Infectious Salmon Anemia virus.” This information was not disclosed to potential investors. The GMO salmon is undergoing regulatory review by the FDA and isn’t being commercially produced yet. Consumer polls show opposition to this type of fish, and several major retail outlets, including Kroger and Safeway, have stated they will not offer it for sale in their stores.